While on a day of guided fishing with Taylor Edrington of Royal Gorge Anglers I asked him what his favorite hopper imitation was. Without hesitation Taylor replied with Pool Toy, and given Taylor’s experience guiding and fishing all around the world and his many hours guiding on the Arkansas River, I made a mental note to tie some. I searched YouTube and the internet for tying instructions, but could not find any. I found some photos on the web pages of online fly merchants, and read about the originator, Andrew Grillos, a native of Colorado. I continue to search for a productive buoyant foam hopper pattern that will be highly visible and float like a cork while suspending size 14 beadhead nymph patterns. I wasn’t totally satisfied with the Charlie Boy Hopper, so I’m hoping the pool toy may be the answer. Fortunately a recent article in Southwest Fly Fishing featured step by step instructions for producing a Grillos Pool Toy so I made a copy and studied it. I reviewed the material list and determined I had everything but a material to make pink indicators, so I decided to forge ahead and substitute a bright neon green material left over from a project completed over the holidays by my son and daughter. My first two prototypes were encouraging, but I struggled with what type of rubber leg to use and how to attach the rear legs and what color dubbing to use as a base under the first layer of foam. I decided to call Taylor and get his input. Taylor told me he didn’t use dubbing as it absorbs water and instead used a type of floss thread to create a base on the hook. In addition he said he used colors that match the first layer of foam, but indicated this isn’t necessary, and he frequently departs from this convention with attractor materials. As to the legs he advised Sexi legs as the material that he prefers. The material I used on my first couple prototypes was yellow barred Centipede legs. I love their look and rigidity, but the knots on the hind legs have a tendency to unravel and not hold. It was around this time that I discovered Andrew Grillos’ web site and sent him a quick email asking for his advice on the rubber/silicone legs. Andrew suggested the Centipede legs and recommended pulling the knot tight almost to the point of breaking. He suggested applying Zap a Gap or some form of quick drying adhesive to the knot as well and recommended coating the thread wraps where the legs are attached with head cement for additional durability. 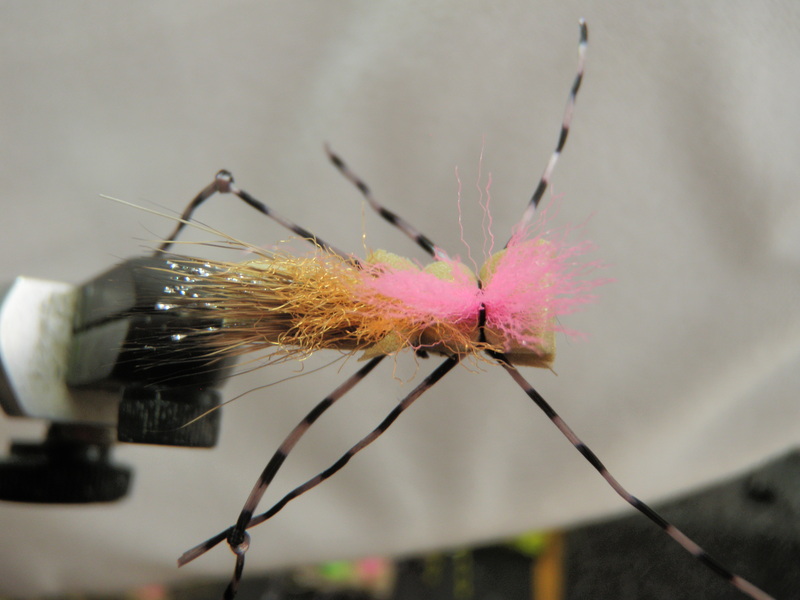 I ended up making a trip to Charlie’s Fly Box during a lunch break and found Sexi Legs along with a bright pink fiber that would be ideal as a strike indicator for the front section of the fly. I’ve now completed eleven Grillos pool toys using both Centipede legs and Sexi legs. Eight of the hoppers are tan and three are yellow, and I plan to manufacture three more pink versions which Taylor swears are very effective. 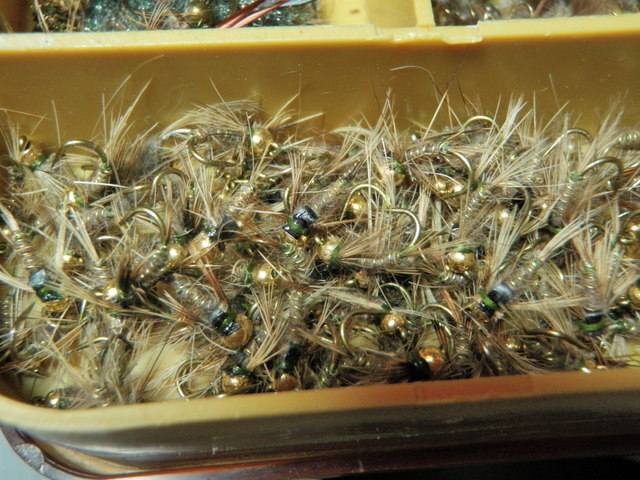 I’m very pleased with the look of these flies and I am very anxious to toss on a stream to test their buoyancy. As in previous years, I am attempting to highlight my ten best fishing days of the previous season. I counted 73 outings on my 2012 fish counter so it took quite awhile to read about these experiences and cull the list down to 21 qualifiers. I read the 21 remaining candidates and in some cases scanned them a third time. Finally after much consternation, I’ve ranked my top ten fishing experiences of 2012. 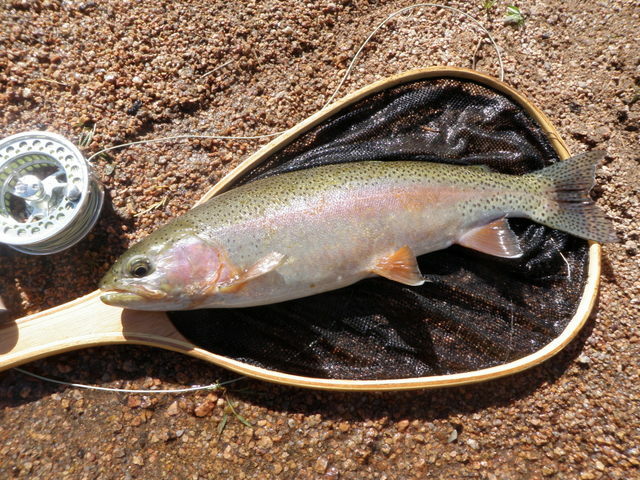 I began fishing on March 13 and ended on November 21 and visited the stream 73 times resulting in 930 landed fish. It was an outstanding year. Here are the top ten. It was the earliest I ever ventured into Wildcat Canyon and the flows at 167 cfs were the highest I’ve experienced in this beautiful remote stretch of the South Platte. I landed 35 chunky fish and most were brown trout, another unusual aspect of this trip. 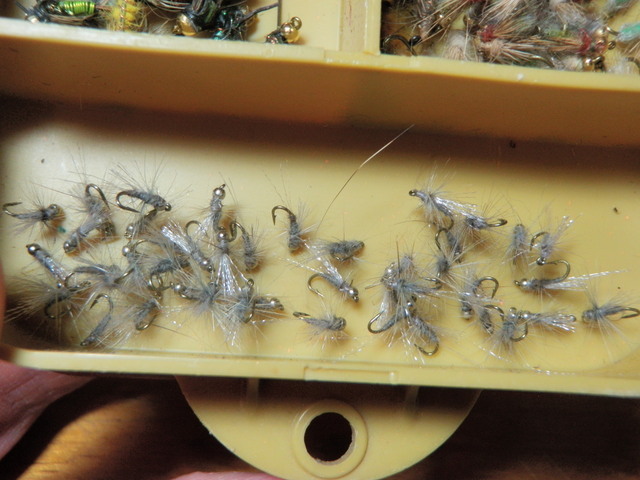 The fishing was ridiculously excellent using the most basic of approaches…hopper/dropper. Breaking the tip of my beloved Sage rod while landing a feisty rainbow couldn’t ruin this outstanding day on the Arkansas River. The fabled caddis hatch was never found on this day, but no matter, as I landed 22 larger than average trout including some fine hard fighting rainbows. The workhorse RS2 took many fine fish on this day in April. I struggled to match the intense early afternoon hatch, but more than salvaged the day by landing nice fish on the gray comparadun as fish apparently looked for stragglers after the main emergence. An area frustrated me for an hour in the morning but a triumphant return in the late afternoon was very gratifying. Keen observation enabled me to notice an early BWO hatch resulting in some nice fat fish prior to being pushed out of my hard earned prime spot on the upper water by insensitive fishermen. Fortunately this bit of adversity forced me downstream to the spring area where I experienced the best green drake action of 2012. 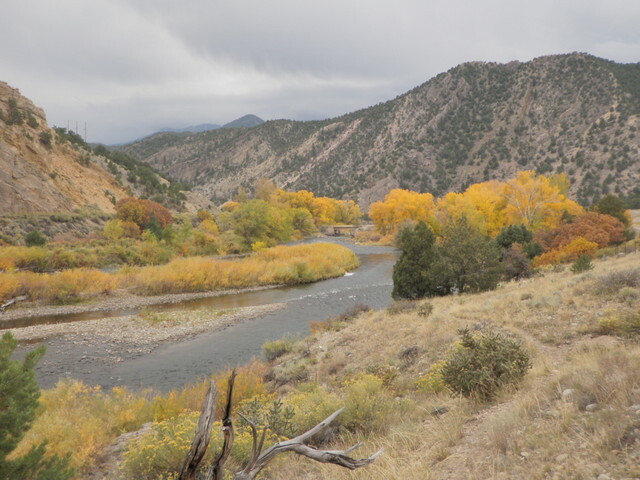 Plenty of break offs and lost fish, but still a great fall day on the Arkansas River landing larger than average trout on the beadhead hares ear and RS2 extended from a Letort hopper. Large fish from relatively shallow lies always makes for exciting fishing. 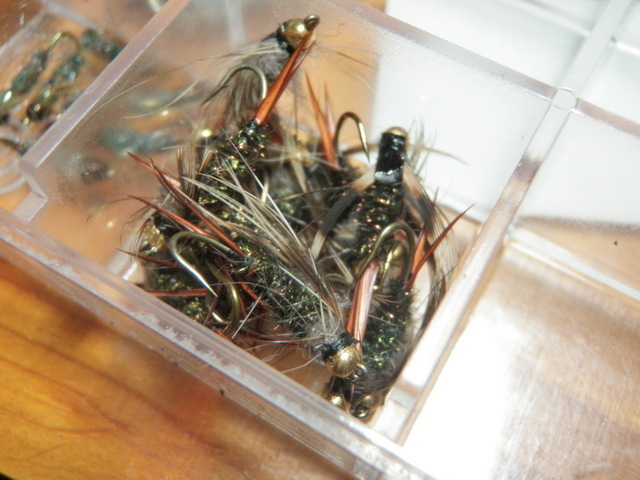 The Parachute hopper and beadhead hares ear combination caught fire. The highlight was a fifteen inch brown landed from an obscure location with less than two feet of water. Catching oversized fish compared to the size of the stream is always fun, and that’s exactly what I experienced on Red Mountain Creek on the Soward Ranch near Creede, CO. 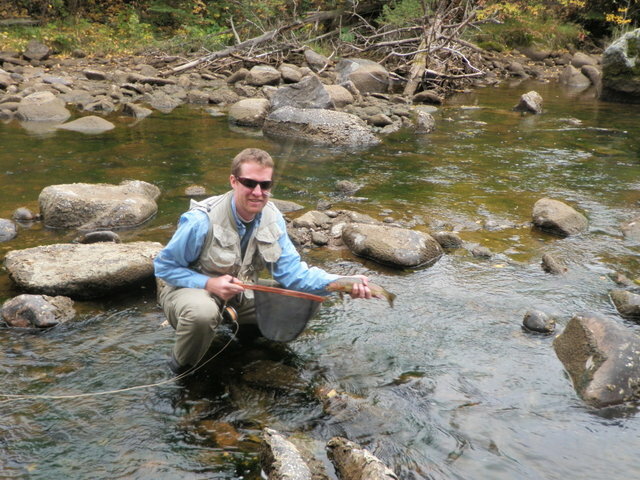 I experienced a great day catching trout on caddis pupa by imparting jigging action and downstream mends. Catching twelve trout on caddis dry flies in late afternoon was icing on the cake and the best action I saw during the Arkansas caddis hatch. Dan and I spent a wonderful weekend backpacking into Wildcat Canyon and experienced some outstanding fishing on Sunday September 9. Dan outfished me on this special day, and Dad was extremely proud. The beauty of greenback cutthroats is unsurpassed. Size isn’t important when I’m in such a beautiful setting catching these high country gems. There you have it, my arbitrary assessment of the best ten fishing experiences of 2012. There were many fine days that didn’t make the cut, and in fact every day of fishing is a day to remember, thus this blog. 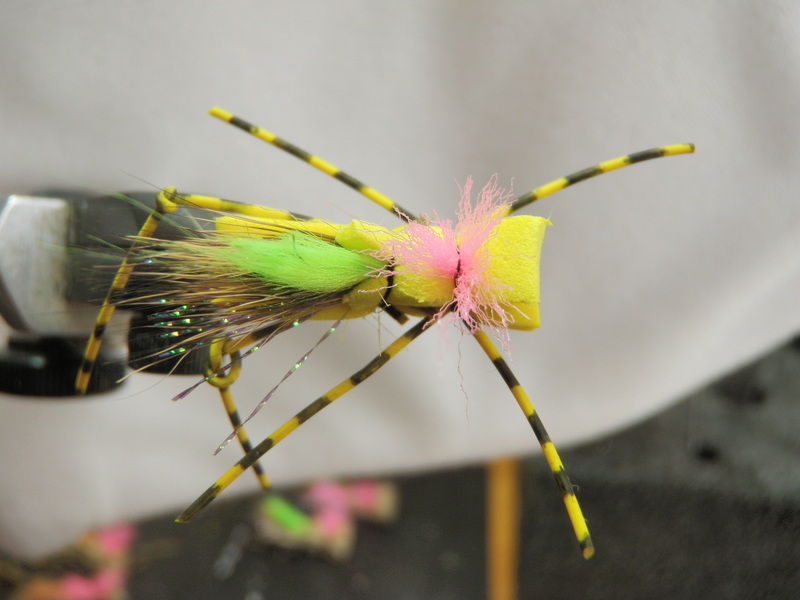 Another fly I was introduced to by Taylor Edrington is the Iron Sally which serves as a nymph imitation of the yellow sallies that are prevelant on many Colorado streams during the summer. I purchased a couple from Royal Gorge Anglers but wanted to produce some on my own this winter, and over the weekend I had my opportunity. I found a YouTube video that demonstated the tying steps, and made a trip to Charlie’s Fly Box to purchase ingredients that I was missing. I bought some Tiemco 5262 size 14 nymph hooks, gold ultra wire, and some black crystal flash and returned home to begin the process of tying my first prototype. The fly is more time consuming than a hares ear nymph mostly due to the split out of the crystal flash fibers and the amount of materials added to the thorax area late in the process. I ended up using three different dubbing materails for the thorax area, but my favorite was natural hares ear. I ended up making five to go along with the one that I purchased and they look very attractive, but I wonder if they are really any more effective than a hares ear. 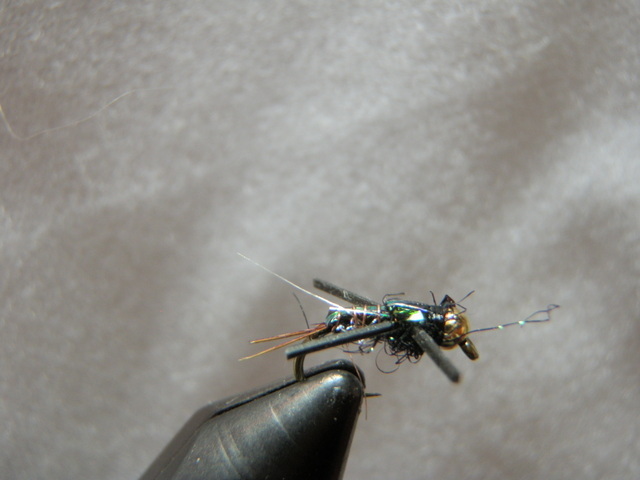 The ultra wire abdomen definitely gives the fly more weight and the crystal flash makes it stand out more. I’m anxious to give it a try and let the fish determine what they prefer. On to Pool Toy hoppers as my next new tying project. During several early trips to the Arkansas River I stopped at the Royal Gorge Angler and purchased some Arkansas Rubber Leg weighted nymphs, and I used these with positive results in my early season visits. The Arkansas Rubber Leg in combination with a beadhead RS2 proved particularly effective on several occasions. On one of my later trips I stopped at RGA and asked Taylor Edrington to pull all the materials needed to tie these nymphs from his fly tying material stock. 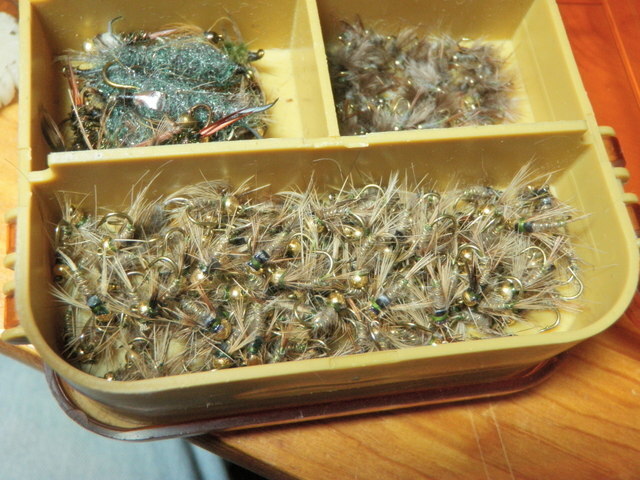 These sat on my fly tying desk for the remainder of the summer in a bag, but over the last few days I found myself in a position to tie this new fly for my arsenal. 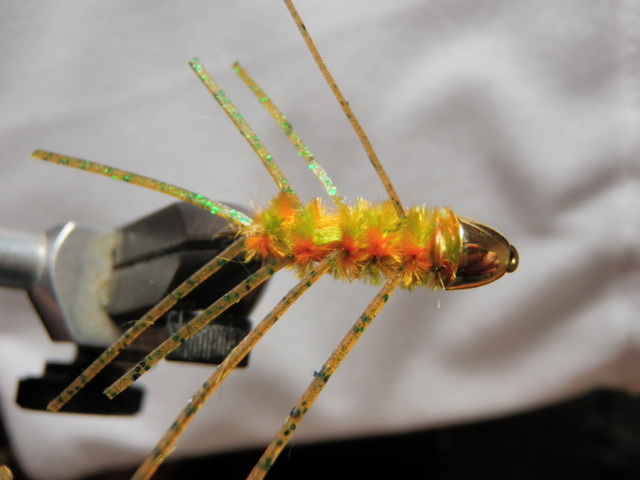 I found several You Tube videos that demonstrated how to tie Pat’s Rubberleg, and the Arkansas Rubberleg is essentually the same fly with slightly different colored chenille and rubber legs. 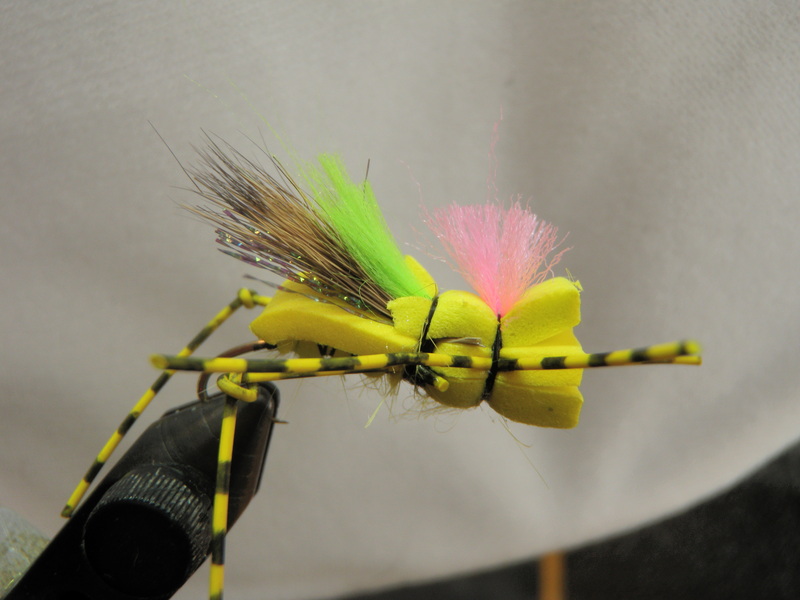 The fly is actually fairly simple to tie with the greatest challenge in aligning the rubber legs and then wrapping the chenille so it doesn’t lock down the rubber legs as you move forward. I’ve now completed eight and plan to make two more yielding ten in addition to the quantity I purchased as I head into the 2013 fishing season. On a guided fishing trip on private water of the Arkansas River in September my guide introduced me to the twenty incher stonefly imitation. I made some in October, but resolved to tie more during my winter tying sessions. Over the weekend I produced additional twenty inchers to increase my inventory to 20 entering the 2013 season. Hopefully the fish love the look of these as much as I do. I had some success on a couple late outings on the Arkansas River, and this fly has been around for quite a while in Colorado, so it is a proven producer. Another fly that I tied and tested during 2012 is the salvation nymph. 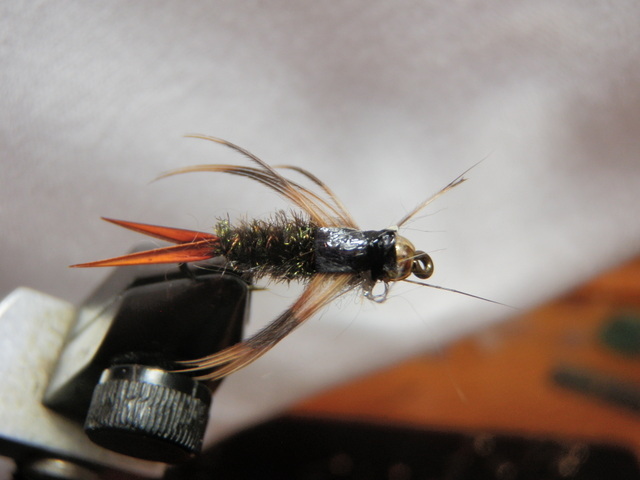 Until I returned to the Conejos River in July, I did not know what this fly was called, but I attempted to tie some by using a purchased fly as my model. These turned out rather nice and I used them with some success in October and November. 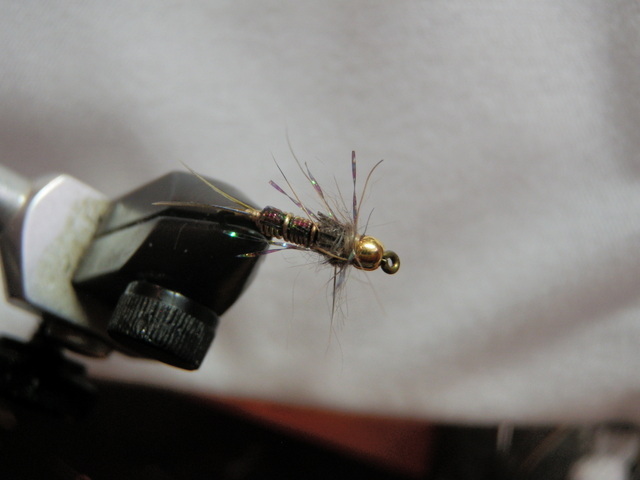 I’m now in the process of tying additional quantities with the goal of entering the season with 25, and I’m considering using this fly in situations where I would normally use copper johns or beadhead pheasant tail nymphs. A reader of this blog suggested that I use black peacock ice dub for the thorax so I purchased a pack and have been implementing that adjustment to my salvation nymph ingredient recipe. I love the look of this fly and hopefully the fish will like it even more. I’m also considering some color variations on the salvation nymph theme. My last day of fishing in 2012 was November 21 on the Big Thompson River, and 2012 offered the longest fishing season I can remember as I began in early March and ended just before Thanksgiving. It was certainly a year to remember. 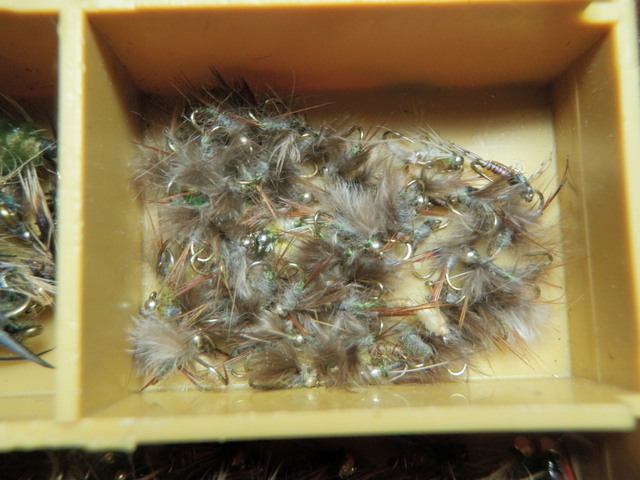 As I entered October I noticed that my supply of beadhead hares ear nymphs was low so I actually began my production tying then and continued through the end of the year while continuing to fish concurrently. So far I’ve stocked my fly boxes with 100 beadhead hares ear nymphs, 50 beadhead RS2’s, 50 beadhead pheasant tail nymphs, 25 BWO size 22 soft hackle emergers, 45 bright green caddis pupa, 30 emerald caddis pupa, 25 light yellow caddis pupa, 15 black and olive beadhead midge larva, and 25 duke nymphs (simplifed prince nymphs). I’ve now entered the realm of tying flies newly discovered as effective in 2012, and this includes my current work in process twenty inchers. I hope to enter the season with 20 of these so I probably need to tie 10 more. Next up in the nymph genre will be salvation nymphs (20), Arkansas rubber legs (20), and iron sallies (20). That should put me in a good position in the nymph category, and I will then move into large attractor dry flies including Letort hoppers and Chernobyl ants. I was disappointed with the Charlie Boy hopper, so I plan to attempt some Pool Toys as recommended by Taylor Edrington. After I am satisfied with my large attractor dry fly supply, I will take an inventory of my standard dry flies such as comparaduns and caddis dries and restock as necessary. 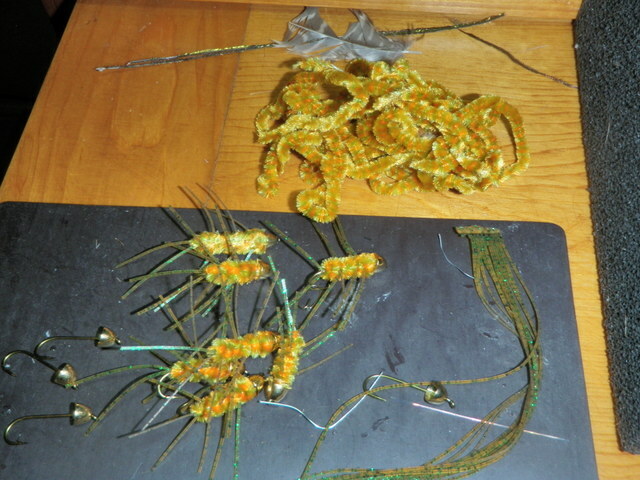 There is a lot of work in front of me, but I truly enjoy tying and especially experimenting with new flies. The advent of YouTube fly tying videos has been a huge benefit to tyers such as myself.